Earlier article we learn How to create structure, now we will learn how to create table types. the table that gets created will only exist within our ABAP Code and not in the database. You need to create one structure before you can create table types. In this example we create the structure ZSTMM_ITEM_POD. The table types are also created using Transaction SE11, Select the radio button DATA TYPE and enter table types name you want to create for example : ZTTMM_ITEM_POD then press button CREATE. After you press button CREATE, the popup screen show, you need choose Table Type the press OK. The next screen you need to entered Short Text for your table types and on the Line Type tab you need to entered your structure on Line Type. On Initialization and Access tab optionally you can choose Type of your table types for default value is Standard Table. 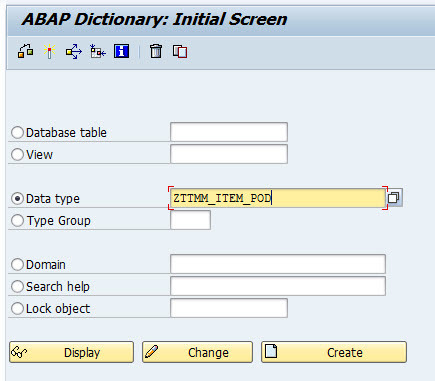 After you click SAVE and Activate button, your table type is now available to be called from an ABAP Program.